X Obwohl es keine Augen hat, kann es Hindernisse mithilfe von Ultraschallwellen wahrnehmen. X Bien que dépourvu d’yeux, il repère les obstacles grâce aux ultrasons émis par sa gueule. X Aunque carezca de ojos, puede detectar obstáculos con las ondas ultrasónicas que emite su boca. X Non ha occhi, ma avverte gli ostacoli con le onde ultrasoniche che emette dalla bocca. X 입에서 내는 초음파로 두 눈이 없어도 주위의 장애물을 탐색할 수 있다. Y Es hat keine Augen. Zur Orientierung nutzt es seine Ultraschallwellen-Schreie, um in der Dunkelheit zu fliegen. Y Comme il ne possède pas d’yeux, il n’utilise que ses ultrasons pour se déplacer dans les ténèbres. Y No tiene ojos. Se guía por las ondas ultrasónicas que emite. El eco le indica por dónde tiene que ir en la oscuridad. Y Non ha occhi, ma si sposta agilmente nella notte emettendo ultrasuoni la cui eco lo avverte degli ostacoli. Y 양쪽 눈이 존재하지 않는다. 입에서 초음파를 내어 어둠 속을 날아다닌다. 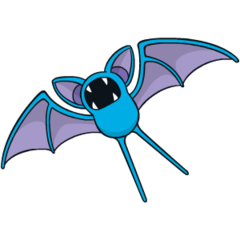 Omega Ruby Zubat avoids sunlight because exposure causes it to become unhealthy. During the daytime, it stays in caves or under the eaves of old houses, sleeping while hanging upside down. Omega Ruby Zubat meidet Sonnenlicht, da es dadurch krank würde. Am Tage hält es sich in Höhlen oder unter den Dachrinnen alter Häuser auf. Dort schläft es mit dem Kopf nach unten. Omega Ruby Nosferapti évite la lumière du soleil, car ça le rend malade. Pendant la journée, il reste dans les cavernes ou à l’ombre des vieilles maisons, où il dort, la tête à l’envers. Omega Ruby Zubat evita la luz del día porque le resulta perjudicial para la salud. Durante el día, permanece en cuevas o bajo los aleros de las casas viejas durmiendo colgado de las patas, cabeza abajo. 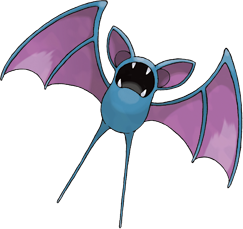 Omega Ruby Zubat evita la luce del sole perché nociva per la sua salute. Durante il giorno sta rintanato in grotte o sotto i cornicioni di vecchie case, dormendo appeso a testa in giù. Omega Ruby 태양의 빛을 받으면 몸 상태가 나빠지기 때문에 낮에는 동굴이나 오래된 집의 처마 밑에 매달려 자고 있다. Alpha Sapphire Zubat remains quietly unmoving in a dark spot during the bright daylight hours. It does so because prolonged exposure to the sun causes its body to become slightly burned. Alpha Sapphire Tagsüber bleibt Zubat an einem dunklen Ort und bewegt sich kaum. Wenn es dem Sonnenlicht längere Zeit ausgesetzt wird, zieht es sich Verbrennungen an seinem Körper zu. Alpha Sapphire Nosferapti reste calme et immobile dans un coin sombre pendant la journée. En effet, une exposition trop longue à la lumière du soleil lui brûle légèrement la peau. Alpha Sapphire Durante el día, Zubat permanece inmóvil y a oscuras. Si este Pokémon pasara mucho tiempo expuesto al sol, correría el peligro de sufrir quemaduras. Alpha Sapphire Zubat rimane perfettamente immobile al buio durante le ore diurne più luminose. Infatti la prolungata esposizione al sole gli provoca delle bruciature. Alpha Sapphire 낮에 어두운 곳에서 가만히 있는 것은 긴 시간 동안 햇빛을 받으면 전신에 가벼운 화상을 입기 때문이다. Sun It sleeps in caves during the day. It has no eyes, so to check its surroundings while flying, it emits ultrasonic waves. Moon When exposed to sunlight, they suffer burns. The frequency of their ultrasonic waves can differ slightly from colony to colony. Red Forms colonies in perpetually dark places. Uses ultrasonic waves to identify and approach targets. Blue Forms colonies in perpetually dark places. Uses ultrasonic waves to identify and approach targets. Yellow Emits ultrasonic cries while it flies. They act as a sonar used to check for objects in its way. Stadium It has neither eyes nor a nose. It emits ultrasonic cries that bounce back to its large ears, enabling it to fly safely. Gold While flying, it constantly emits ultrasonic waves from its mouth to check its surroundings. Silver Capable of flying safely in dark places, it emits ultrasonic cries to check for any obstacles. Crystal During the day, it gathers with others and hangs from the ceiling of old buildings and caves. Stadium2 While flying, it constantly emits ultrasonic waves from its mouth to check its surroundings. Ruby Zubat remains quietly unmoving in a dark spot during the bright daylight hours. It does so because prolonged exposure to the sun causes its body to become slightly burned. Sapphire ZUBAT avoids sunlight because exposure causes it to become unhealthy. During the daytime, it stays in caves or under the eaves of old houses, sleeping while hanging upside down. Emerald While living in pitch-black caverns, their eyes gradually grew shut and deprived them of vision. They use ultrasonic waves to detect obstacles. Pearl Disliking sunlight, it sleeps deep in forests and caves until sundown. Platinum It checks its surroundings and location using reflections of the ultrasonic waves from its mouth. Black It checks its surroundings and location using reflections of the ultrasonic waves from its mouth. White It checks its surroundings and location using reflections of the ultrasonic waves from its mouth. White 2 It does not need eyes, because it emits ultrasonic waves to check its surroundings while it flies.